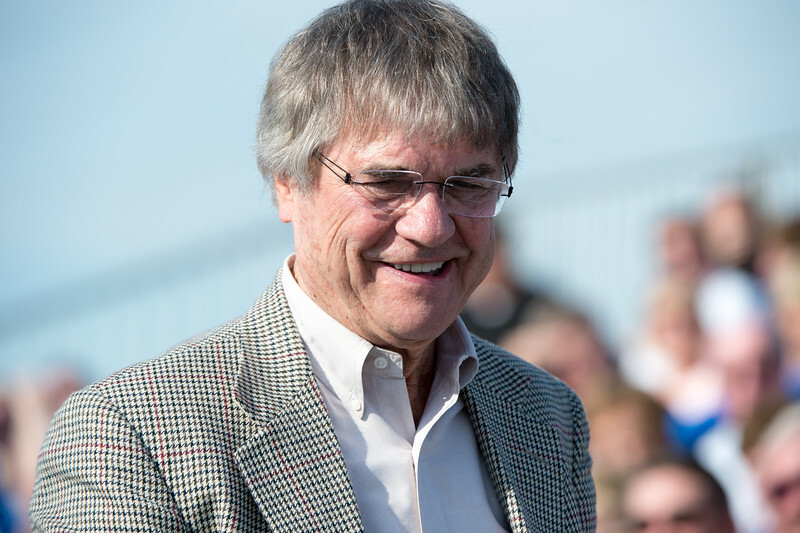 The firing of a starter's pistol by Terre Haute businessman and philanthropist Max Gibson marked the dedication Friday of Indiana State University's newest athletic facility. Sycamore runner John Mascari winning the 5K race in a time of 14:28 provided an added dose of Sycamore pride. 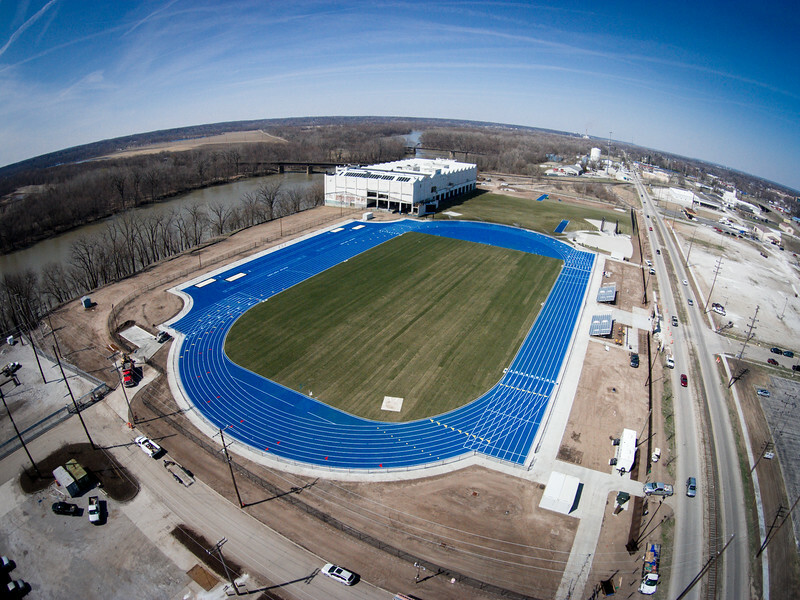 Gibson Track and Field covers 10 acres along the Wabash Riverfront and is one of the first major projects in the city's Riverscape project. Dedication of the $4 million facility is not only the latest example of an ongoing cooperation between Indiana State and the City of Terre Haute, it also marks a significant point in campus expansion on the west side of U.S. 41, university President Dan Bradley said. Bradley thanked Gibson and his wife, Jackie, crediting their "tremendous generosity" for making the facility possible. "You ... have been great friends to Cheri and me, and I appreciate all that you continue to do for our university and community," he said. "Indiana State University plans to continue to invest in the development of the riverfront as resources allow. Today is the day that Terre Haute and Indiana State embrace the river and relish our location ‘On the Banks of the Wabash.'" Gibson Track and Field "is also a tribute to the prolonged and consistent success of our track program and the incredible leadership provided by Head Coach John McNichols, Head Women's Coach Angie Martin, Assistant Coach John Gartland and Assistant Coach Jeff Martin," Bradley said. Bob Baesler, chair of Indiana State's board of trustees and also a Terre Haute businessman, commended Gibson for his visionary leadership in understanding the economic impact world-class facilities can have on a community. "We have been blessed to host the NCAA Division I Cross Country Championships at the LaVern Gibson Championship Cross Country Course more often than not during the last decade," Baesler said. "Today we are pleased to welcome the Gibson Invitational to our community featuring men's and women's track teams from nine different universities. 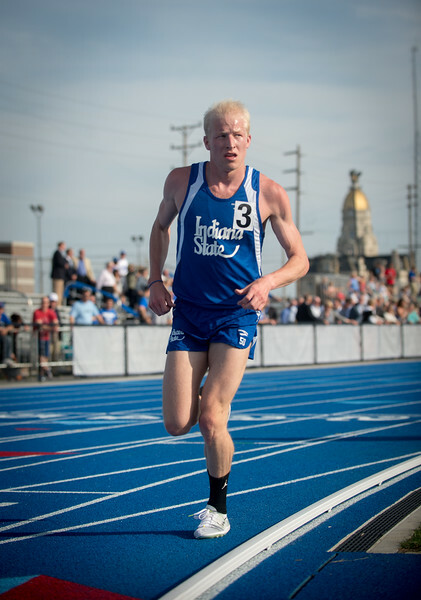 These events have literally put Indiana State and Terre Haute on the map when it comes to cross country, and are now doing the same for track and field. It is not far-fetched to think that Terre Haute will be hosting the NCAA Division I Track and Field Championship someday." Max Gibson said, "We're happy we could help ... We believe that participating in athletics helps build character and also creates a determination for success." Ron Prettyman, director of intercollegiate athletics at Indiana State, thanked not only the Gibsons but also Bradley and Diann McKee, vice president for business affairs and finance, for their support of the new track and field venue. "This project has been a great display of cooperation between university and community," Prettyman said. "As we continue to work toward completion of phases 2 and 3 of this project, this will ultimately be one of the top collegiate track and field complexes in the nation. Our student athletes are proud every day to call this their home." McNichols, who has coached track and cross country at Indiana State for 32 years and earned Missouri Valley Conference Coach of the Year Honors 24 times, called Gibson Track and Field "one of the finest venues in all of the NCAA." The facility features a poured polyurethane track surface by Beynon, which is used on quality track surfaces across the country. It has nine 48-inch lanes with two 110-meter straightaways, four vaulting runway locations, two high jump areas and several throwing sectors. It sports a brick entryway and a video scoreboard. In building Gibson Track and Field, the university "used the same philosophy when we built Lavern Gibson Cross Country course in 1997. We started with a really great base for a facility and continued to improve it year after year," McNichols said. "That's the same approach we used here. Marks Field has been a great home to Indiana State for 50 years, but we are ready to bring in a new era on one of the finest facilities in the country." Katie Wise, a junior from Morgantown and a sprinter for the Sycamores, said, "It is an honor and such a privilege to be here today to help celebrate the dedication of this wonderful track facility. Mr. and Mrs. Gibson, we thank you for supporting Indiana State and our athletics program, especially track and field and cross country." Senior hurdler Adarius Washington of Indianapolis said, "This is just amazing the facility here and this is just the first phase. You have touched many lives with this gift and we hope you know how much this means to student athletes and everybody here at Indiana State University." During a Friday night ceremony in which Gibson received the Distinguished Alumni Award - the ISU Alumni Association's highest award - Rex Kendall, Alumni Association director, said the 1962 business education graduate has not only had a successful career but has also "dedicated much of his time and resources to making Indiana State University a great place to learn, grow and compete." After graduation, Gibson pursued a career in coal sales and trucking with Gibson Coal Co. and Gibco Motor Express. In the 1980s he sold the coal industry business and pursued many other entrepreneurial ventures. He was involved in two local solid waste management businesses, including Jamax Corp. and Victory Environmental Services. He also led several successful residential real estate developments and was a member of the ownership group for the Boston Connection, a popular Terre Haute hotel and restaurant. For the past 25 years, he has served as owner and president of Majax Corp., a business and management consulting firm in Terre Haute. "Max's Indiana State roots and Terre Haute community ties run deep," Kendall said. "He has been involved with numerous local, state and national professional and civic organizations throughout his lifetime. His commitment to his alma mater includes longstanding service on the ISU Foundation Board of Directors and involvement with the Lambda Chi Alpha fraternity." Gibson and his wife, Jackie, are members of Indiana State's President's Society, 1865 Society, and Book and Torch Society and are passionate Sycamore fans. They have been men's basketball season ticket holders for more than 40 years and were influential in the establishment of the LaVern Gibson Championship Cross Country Course which has allowed Indiana State and Terre Haute to become a destination for the sport. Photo: http://isuphoto.smugmug.com/Campus-Scenes/Aerial-Imagery/DJI-Phantom-Aerial-Photography/i-kvxBqqX/0/3X/04_01_15_track_construction-00400-3X.jpg - Gibson Track and Field, dedicated April 17, 2015, represents the first phase of a planned Sycamore Athletic Complex and one of the first major projects in Terre Haute's Riverscape. < Go back to Articles.